CLEAN ACCIDENT FREE LOCAL ONTARIO VEHICLE! Balance of Factory Warranty Remaining! This 2018 Mercedes-Benz AMG S63 Cabriolet comes finished in Selenite Grey on a Red leather interior! Powering this vehicle is a 4.0L AMG Bi-Turbo V8 producing 603hp and 664lb-ft of torque mated to a 9-speed automatic transmission sending power to all four wheels! Features; BURMESTER premium audio, DISTRONIC radar guided cruise control, PARKTRONIC park assist with 360 degree view camera, Heated/Ventilated Massaging Position Memory Seats, Dual 12.3 High Resolution Screens, COMAND infotainment w/ Navigation, AIRSCARF neck level heating system, LED Ambient lighting, Electric Trunk and much more! If you are interested in this vehicle please call or visit our showroom for more information! Price does not include applicable taxes. World Fine Cars Ltd. has been in business for over 30 years and maintains over 90 pre-owned vehicles in inventory at all times. CarProof Reports are always available at no charge. We offer a full service center and we are able to service everything we sell. With a state of the art showroom including a comfortable customer lounge with WiFi access. 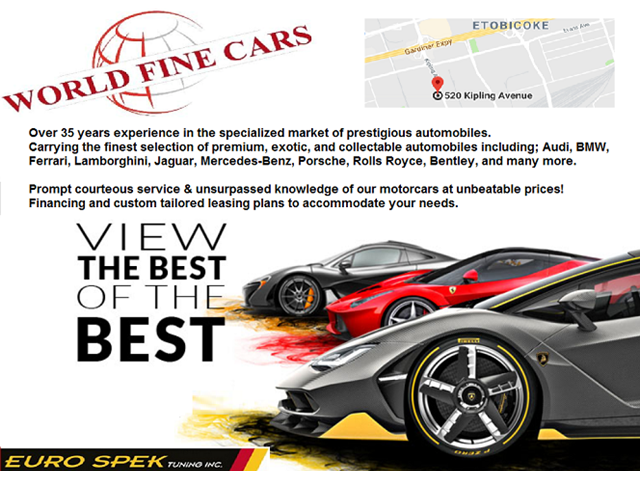 We invite you to contact us today 1-888-334-2707 http://www.worldfinecars.com/.